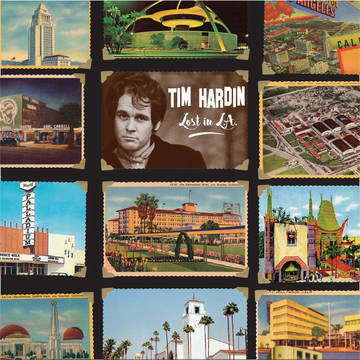 n 1965, a young Tim Hardin left New York City for the ‘California Dreamin’ of Los Angeles. Like many singer/songwriters of the time, he landed at the folk den of the famed music venue, The Troubadour. Holding court there was noted hot L.A. record producer, Jim Dickson. A staff producer for such labels as World Pacifc, Elektra and Warner Bros Records, Jim had access to the World Pacific Recording Studio. The studio where the likes of Sam Cooke, the Beach Boys, Ravi Shankar, Byrds, etc, first recorded. Jim pursued Tim to lay down some of his songs at the studio, providing a back up group with Tim on piano. Recorded on 1/2″, 3 track tape, these recordings have never been heard since they were recorded and three of the four Tim Hardin songs have never been copyright or published until now. The 180 gram vinyl records were pressed at Hand Drawn Pressings in Texas on the newly designed and manufactured ‘WarmTone’ automated presses. Packaged in a limited edition numbered silver foil jacket. Thank you very much. I missed this on Record Store Day, and have been hoping for this to be posted. Any chance you can post the Tim Buckley RSD release “I Can’t See You” (early demos prior to signing with Elektra?